I had a birthday this past week, and friends, family, strangers, and even organizations (I'm talking to you, AARP!) wished me happy birthday. Well, except the cast member at the Haunted Mansion at Disneyland. He saw my birthday button and asked, "Is it your birthday?" I said yes, and he replied, "Have a birthday." Instead of focusing on numbers for this post, let's just approach this Ten Things of Thankful conversationally, shall we? I am thankful for the time youngest daughter and I had to spend at Disneyland on my birthday. I'm also thankful that I didn't slip and fall there. I made the mistake of wearing shoes with zero traction on a day when some strange misty watery stuff was falling from the sky. Yes, it rained on my birthday! I'm thankful it did--I love the rain! However, the rain did make the sidewalks slick, and I felt like a little old lady as I had windmill arms going several times. I'm thankful my daughter was there to keep my upright! I'm also thankful that I had read about a cute birthday souvenir--bringing a birthday card for the characters to sign! Might as well act like a kid, right? I love how the personalities of the characters come out in their signatures! I'm thankful for my mom who was planning a gift for me for decades! (Well, maybe not, but read on.) I received in the mail a folder containing copies of pages of my mom's journal that she wrote when she was my age. It was interesting to read, and to see the similarities between us. I'm thankful the chance I had to go (later in the week) to the Senior Expo--not as a participant (still too young for that, despite what AARP says! ), but as a organization member in a booth. Our local guide dog group passed out information about our puppy club. Drexel got to come and help me man dog our booth. Photo: Drexel sits (rather awkwardly) in front of our table. 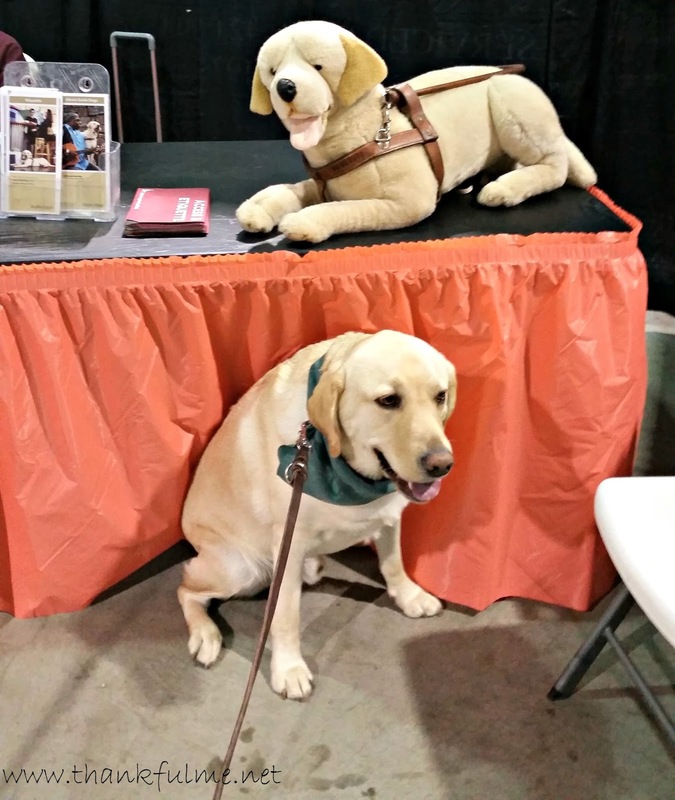 A stuffed animal guide dog in harness sits on the table above him. Photo: "Is there some sort of stuff that sticks up posters liking it he sieve the potty?" "Lol! I'll look!" 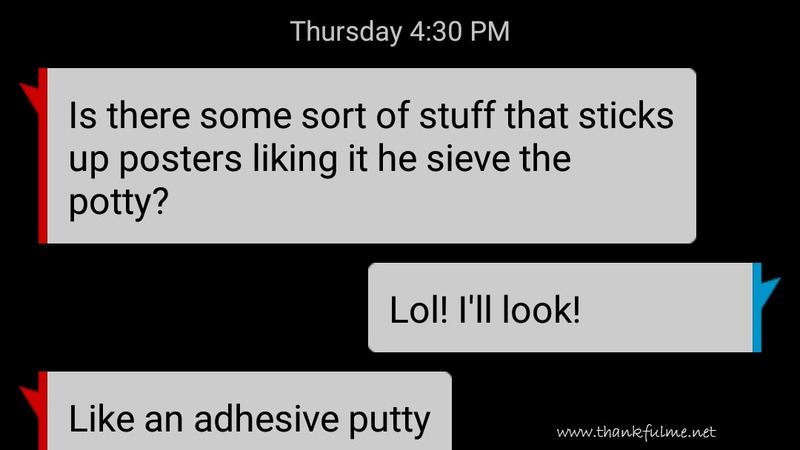 "Like an adhesive putty"
I might be growing older, but I'm not ready for any sieving of potties! Yuck! Your thankfulness always amazes me. Wish I were so thankful. I'm trying. I'm improving. You're posts always get me thinking. 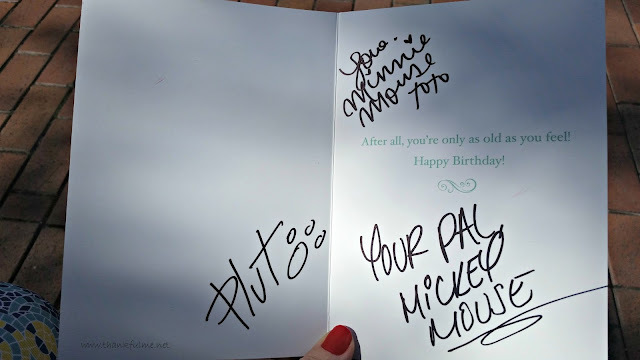 Love the birthday card signed by the characters. Happy belated Birthday. I'm happy your special week was fun. I think I need to take birthday cards to Disneyland more often, so I can give away cards signed by characters. I know my oldest daughter wants one. Retaining a child-like heart is an essential for birthday celebrations and it sounds like you got it just right! Well, except for the windmills, and I would be doing those too! I'm glad that you had a wonderful birthday, and most importantly that those you love the very most all did their best to let you know how much you are loved and appreciated! Im glad you had a great birthday!!! I can just picture you getting those birthday signatures at Disneyland. So cute! Hubby's text will surely keep you smiling for another 50 years. It was a funny one, that's for sure! Good to hear that the weather cooperated to make your birthday even more memorable (from what I understand about the climate you live in). Its good not to slip and fall, not just in Disneyland, but everywhere else. Yes, raindrops are rarities, and I agree that slipping and falling is to be avoided, no matter where I might be. Drexel enjoyed his time, even though it might not seem so from the photo. Happy birthday once again - glad it was a good one! Today I am thankful for that rain we got on your birthday! We need more rain!!! Glad you had a wonderful birthday! Yes, we do need more, and I hope we get more! Thanks!